Next post: Childhood Memory: Upper Marlboro Day! Tiffy’s take on the Crunch Wrap Supreme. One of my favorite items on the Taco Bell menu is the Crunch Wrap Supreme. The past few days I’ve been craving it! But I refuse to eat Taco Bell anymore because the meat is a little suspect. In the midst of this craving, I came across a homemade recipe on Facebook. I knew I had to try it myself! 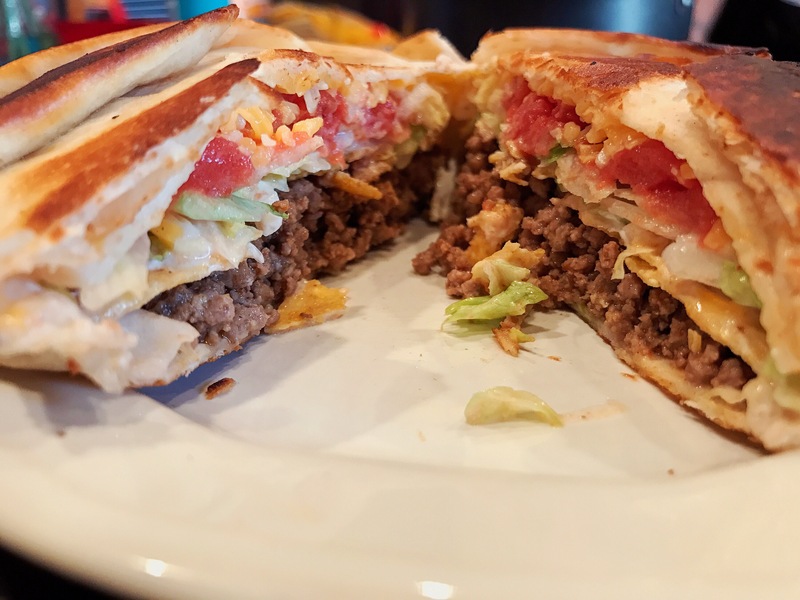 I made the Crunch Wrap today, and let me say…it was BETTER than Taco Bell’s version. And I’m not just saying that because I made it, I have my Bestie and her wife to back me up. It was delicious! And honestly turned out waaaayyyy better than I expected. Paired with some rice, sweet chili sauce and red wine, it was the perfect, filling dinner! 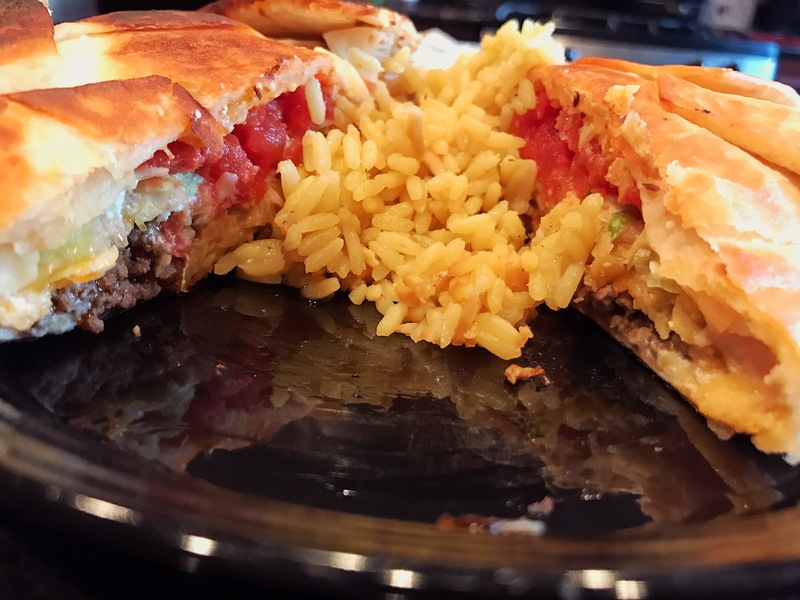 Take a look at the recipe and the pictures of my take on the Crunch Wrap and try it yourself. It was super easy and took little to no time. It’s definitely a quick and easy dinner! In a skillet over medium heat, add ground beef, chili powder, paprika and cumin. Cook, breaking the meat up with a wooden spoon, until the beef is no longer pink, about 5 minutes. Drain fat, then season with salt and pepper. Cut small flour tortillas: Stack four large flour tortillas and place a tostada shell in the center. Using a paring knife, trace around the edges of the shell to cut four smaller flour tortilla rounds. Set aside. 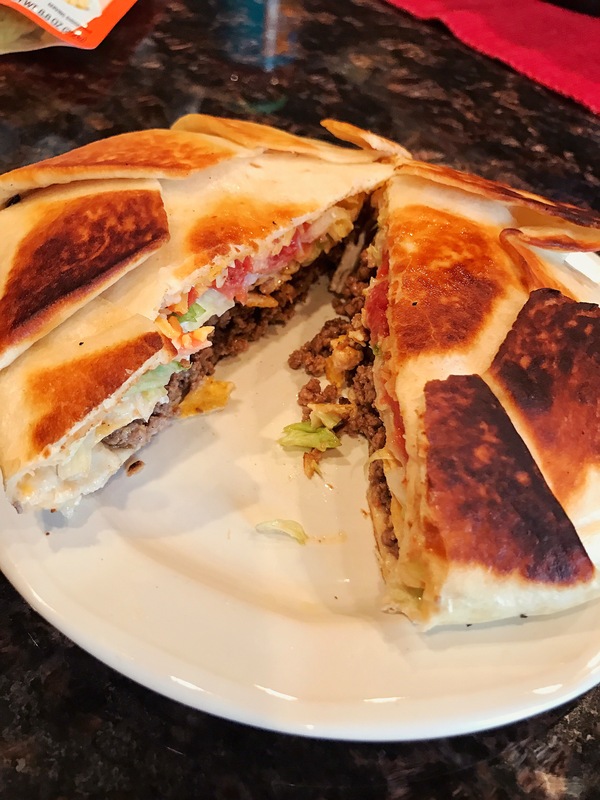 Build crunchwraps: With remaining large flour tortillas, add a scoop of ground beef to the center of each tortilla, leaving a generous amount of space around the edges for folding. Drizzle cheese sauce over each, then place tostada shells on top. Spread sour cream over each shell, then top with lettuce, tomato, and cheeses. 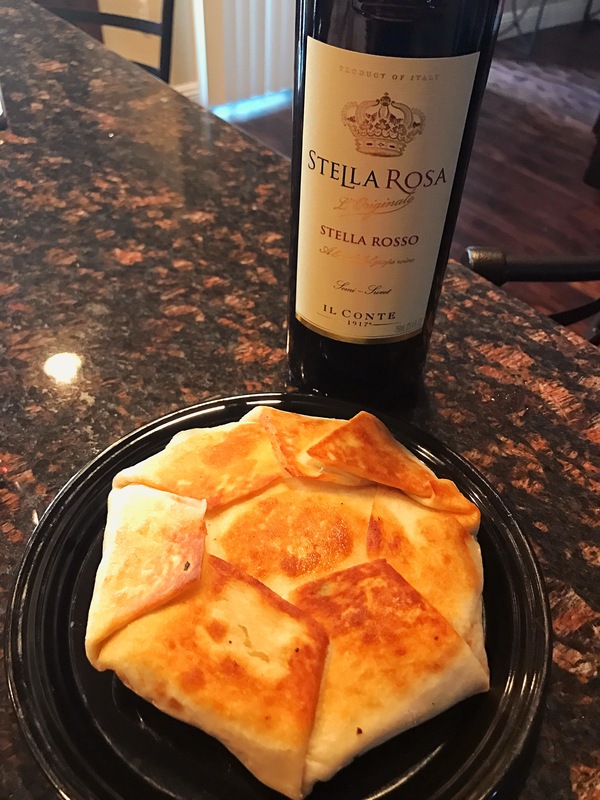 Place the smaller flour tortilla cutouts in the center of each crunchwrap then tightly fold the edges of the large tortilla towards the center, creating pleats. After wrapping, quickly invert crunchwraps so the pleats are on the bottom and they stay together. Cook crunchwraps: In a medium nonstick pan over medium heat, heat a very thin layer of vegetable oil. 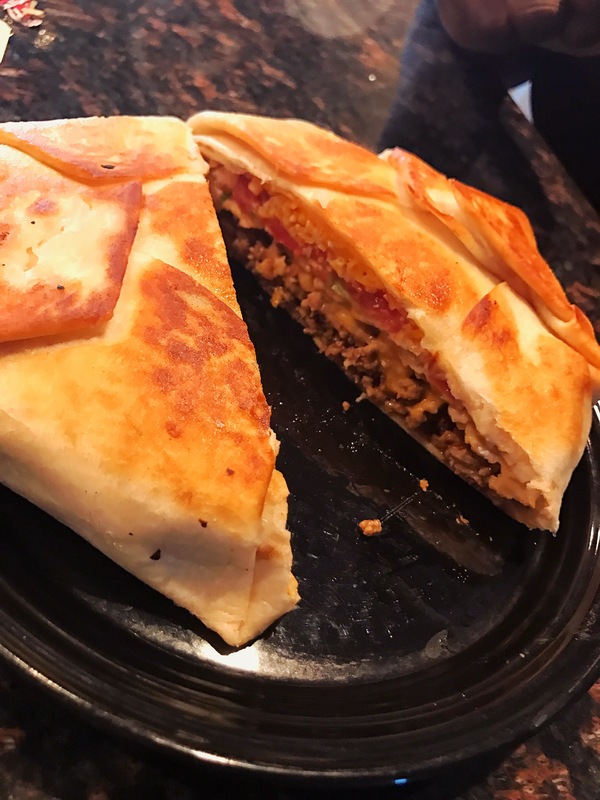 Working one at a time, add crunchwrap seam-side down and cook until tortilla is golden on the bottom, 3 to 5 minutes. Flip crunchwrap and cook until the other side is golden, 3 to 5 minutes more. Repeat with remaining crunchwraps and serve warm with hot sauce.